Displays | What Are You Reading? Sponsored by The Association of Book Publishers of BC (ABPBC), Read Local BC is a campaign to encourage the public to support the local book industry by visiting libraries, and reading and purchasing BC books. From April 8-22, Read Local BC will feature a media relations campaign, promotional materials (postcards, bookmarks, posters, bag stuffers and advertisements), and more than 20 author events throughout the province. 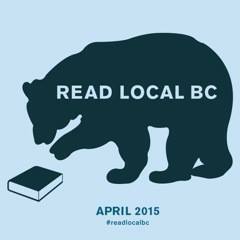 Promote Read Local BC on your social media feeds. 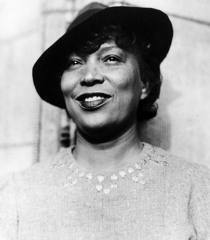 The ABPBC is preparing a list of BC books that we will share with you in the weeks to come. If your library would like to host an event for Read Local BC, or if you want more information about the campaign, email Natalie Hawryshkewich: natalie@books.bc.ca. Natalie will send you promotional material make sure that information about your events is passed on to the ABPBC’s communications company, ZG Communications, who will be coordinating media. This entry was posted in Community, Displays, Marketing and Promotion and tagged April, Authors, BC, Books, British Columbia, Read Local BC on February 20, 2015 by nvcllibrarian. One of the things I’ve always enjoyed doing is creating displays. One of the things I rarely have time for is creating displays. Thus I have become a devotee of Pinterest. And while I do have a board for Shoe Lust and other frivolous things I actually started using Pinterest to collect ideas for library displays. 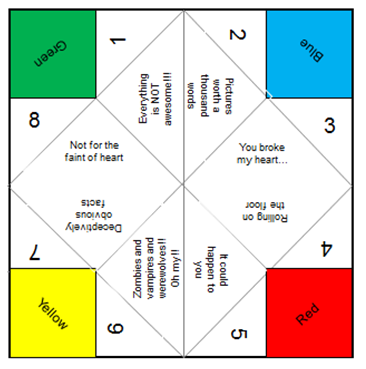 One RA display we’re working on now is using paper fortune tellers or cootie catchers in a teen display. A colleague came up with the idea and I like the interactive nature of this display idea. She redesigned the categories for a teen audience making them more creative and slightly esoteric. Another colleague created a Reading Tree display and a Book In A Jar that gets people to guess the name of the book cut up in pieces and placed (strategically) in a mason jar. The Book In A Jar was wildly popular and a great passive programming idea. It’s tactile and beckons people to pick it up, which they did. It’s labour intensive though and only good once. If you’re part of a bigger system or can share it with other libraries the program has more life. I’ve tried Pinterest too for straight up RA. I did searches like “If you liked A Fault in our Stars” or Divergent and the results were just ok. There’s a lot of flotsam to get through till you find something useful. When I’ve got someone standing in front of me asking me to recommend a book to them, Pinterest is not the first place I turn to. Interestingly though in the last couple of weeks Pinterest has added limiter buttons to their search capacity. I found that Reading Lists is a good one to start with and then you add (and/or subtract) limiter suggestions, like 2014, classic, kids, etc. Unfortunately, another thing Pinterest did recently was add an annoying “There’s more to see” shadow that partially blocks out results so that those without accounts can’t easily see the images. A favourite by-product about using Pinterest to generate ideas (or outright steal) is that the photos give viewers a glimpse into the libraries themselves. For the most part the images aren’t stylized; they’re real. I can see the info desks, notice the industrial lighting or covet a swanky new space. I love the creativity that library staff exudes using paper and ingenuity. We all love to share those things we’re most proud of. In this sense, Pinterest is an excellent tool that reaches beyond our walls to share our successes. If you have any Pinterest boards you’d like to recommend post them in the comments below. This entry was posted in Displays, Marketing and Promotion and tagged Display ideas on September 29, 2014 by agoffe.